May 7, 2014 • [Source: CU-Boulder] An international team led by glaciologists from the University of Colorado Boulder and Trent University in Ontario, Canada has completed the first mapping of virtually all of the world’s glaciers—including their locations and sizes—allowing for calculations of their volumes and ongoing contributions to global sea rise as the world warms. The project was undertaken in large part to provide the best information possible for the recently released Fifth Assessment of the Intergovernmental Panel on Climate Change, or IPCC. While the Greenland and Antarctic ice sheets are both losing mass, it is the smaller glaciers that are contributing the most to rising seas now and that will continue to do so into the next century, said Pfeffer, a lead author on the new IPCC sea rise chapter and fellow at CU-Boulder’s Institute of Arctic and Alpine Research. 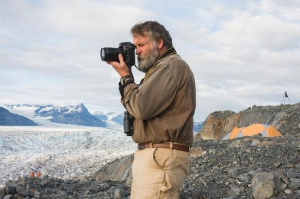 “I don’t think anyone could make meaningful progress on projecting glacier changes if the Randolph inventory was not available,” said Pfeffer, the first author on the RGI paper published online today in the Journal of Glaciology. Since the world’s glaciers are expected to shrink drastically in the next century as the temperatures rise, the new RGI—named after one of the group’s meeting places in New Hampshire—is critical, said Pfeffer. In the RGI each individual glacier is represented by an accurate, computerized outline, making forecasts of glacier-climate interactions more precise. The team used satellite images* and maps to outline the area and location of each glacier. The researchers can combine that information with a digital elevation model, then use a technique known as “power law scaling” to determine volumes of various collections of glaciers. In addition to impacting global sea rise, the melting of the world’s glaciers over the next 100 years will severely affect regional water resources for uses like irrigation and hydropower, said Pfeffer. The melting also has implications for natural hazards like “glacier outburst” floods that may occur as the glaciers shrink, he said. The total extent of glaciers in the RGI is roughly 280,000 square miles or 727,000 square kilometers—an area slightly larger than Texas or about the size of Germany, Denmark and Poland combined. The team estimated that the corresponding total volume of sea rise collectively held by the glaciers is 14 to 18 inches, or 350 to 470 millimeters. Part of the RGI was based on the Global Land Ice Measurements from Space Initiative, or GLIMS, which involved more than 60 institutions from around the world and which contributed the baseline dataset for the RGI. Another important research data tool for the RGI was the European-funded program “Ice2Sea,” which brings together scientific and operational expertise from 24 leading institutions across Europe and beyond.